FireSong Creations & My Inspirational Journey: 2 more cards .. I know it's christmas time & most people are doing christmas cards, but hey, I always like to be different, so here are 2 cards I made yesterday that aren't christmas related. The first one (well I hope its the first one, I always seem to upload them in the wrong order)I created the background by using black gloss cardstock & swirling copper alchol ink mixative onto it which gave it a rather gorgeous effect. The black square frame is just cardstock & black opals which have been stamped to give the texture. The cameo is a mould done with Delight & it, along with the photo corners & little plaque with the word on it have been coloured with a Krylon Copper pen. The second one I decided to do because I had seen a card somewhere months ago with similar colours (but I have NO idea where now, in reality the colours are probably completely different, but this is what I remember LOL) & I really liked the colour scheme so I decided to give it a go. I used one of my Paper Artsy stamps as the central design, coloured it with a waterbrush & my Marvy markers & then sponged distress inks on around it in different directions to create the textured effect. I think it looks great & love the effect, I will be trying another one with different colours soon! 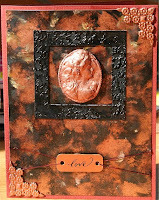 hey robyn, I linked your bloggy to mine, hope thats ok.
how cool are your cards, I love doing backgrounds!